The thing that is awesome about this orange essential oil is that it is steam distilled not expressed. So it has the same awesome properties as expressed Orange essential oil, but. slightly sweeter aroma and different energetics. The perfectly ripened Citrus sinensis fruit rinds come together to create a stunningly sweet, perfectly citrusy essential oil that is a lovely choice when looking to help support the digestive system and work to reduce nausea. Sweet orange essential oil is often used when looking to reduce minor pain and inflammation as well as reduce the presence of unwanted bacteria. Emotionally and energetically, sweet orange essential oil brings bright energy and positivity to those struggling with situational depression or a negative outlook. It can provide courage to those who are overwhelmed or reluctant to ask for help. 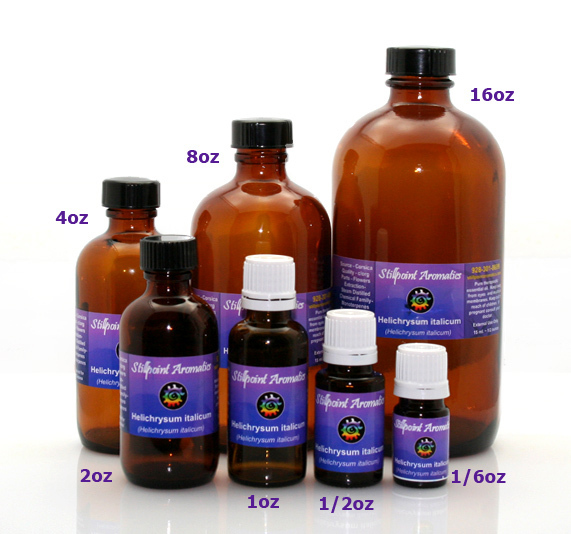 Sweet orange essential oil is often overlooked as a powerful medicinal oil. Sweet orange is perfect oil to use with ALL people, ALL ages. And it is one of the most versatile and effective essential oil to use alone or in formulations. For the physical body, orange essential oil is effective for digestive issues, nausea, tummy aches, minor muscle aches, and pains, and is a great skin tonic. For the mental and emotional bodies orange essential oil is uplifting and a wonderful mood enhancer. It is like sunshine in a bottle. The orange is actually a hybrid between pomelo (Citrus maxima) and mandarin (Citrus reticulata). Sweet orange trees, with a long season of bloom and colorful fruit, are hard to beat for attractive foliage year-round. Their dual use as a fruit and ornamental tree. 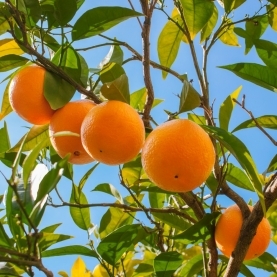 Most sweet orange sold are grafted onto dwarfing rootstock, keeping them less than 15 feet tall at maturity. They form a rounded tree or large shrub with glossy leaves. The white flowers are highly scented and attract many pollinating insects. Fruit is present much of the year since it takes many months to mature, but only takes on its characteristic orange color when it is nearly ripe. Sweet Orange Essential oil is like connecting to the sun. For most, the aroma of fresh oranges brings back joyful memories. We use orange essential oil when we want to connect with our childlike quality, remember how to play, creation, expression, and big fun. Orange essential oil is expressed or distilled from the rind and this can also offer for energetic protection. It can help soften perfectionists, and also allow self to make mistakes. It moves stuck and negative energy and lightens the energetic feel. Orange essential oil is balancing to the second chakra. So when you are in need of inspiration and balance in your relationships, including orange in your formulation will help! The additional energetic property that the steam distillation adds to this essential oil is that it assists in transformation and integration. The orange originates from oriental Asia (China, India, and the Asiatic South-East). Orange was first mentioned by the Arabs and they were the first to introduce the orange to Europe. The word orange comes from the Arabic word ‘narandj’, which means ‘orange’. The golden apple (orange) was the fruit that Juno gave to Jupiter on the day of their celestial wedding. In Greek mythology, the orange is a symbol of innocence and fertility, This is seen in the myth of Atalanta. The story goes like this, Atalanta was the fastest mortal and would only get married to the man that could beat her in a race. When her challengers lost, she would kill them. It wasn't until Aphrodite, the Goddess of Love helped Milanion. Aphrodite gave him a bunch of oranges and during the race, he dropped them along the way, distracting Atalanta and winning the race, They were married, and Atalanta became a mother and a housewife-the symbol of innocence and fertility. The exchange of an orange between unmarried men and women was a simple charm to invite love to blossom between the two. Limonene may reduce depression, stress, and anxiety as well as inflamation. D-Limonene is a selective activator of the adenosine A(2A) receptor on cell membranes. These receptors are vital for nervous system function. The lack of their activation is associated with anxiety, insomnia, and impaired dopamine transmission (addictive tendencies and lack of motivation). A lack of activation of adenosine A(2A) receptors on immune cells results in a hyperimmune response (allergic reactions). Limonene was found to dissolve gallstones in a recent study. It activates several of the Phase I and Phase II liver detox enzymes responsible for clearing toxins. The terpenes of d-Limonene literally dissolve fat sludge. Think of it as an internal degreaser! So, you can see how orange is a powerfully medicinal oil for the physical, emotional, spiritual and mental bodies. The Citrus oils can contain anywhere between 66 and 95 percent d limonene! Citrus oils are very high in monoterpenes and may cause skin irritation in those people who have sensitive skin. Do a test patch and use in low dilution when applying to the skin. Be sure to buy freshly distilled citrus oils, as oxidized citrus oils are skin irritating. Make sure the citrus essential oil is distilled/extracted from organic or un sprayed fruit as the oil comes from the rind. Orange and Blood Orange oil are not photo-toxic.